What is the best way to celebrate any holiday? With delicious and festive food, of course! 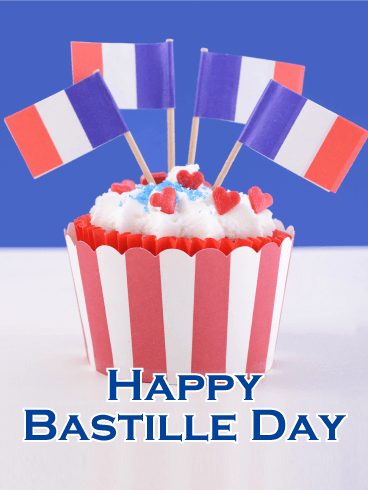 The scrumptious cupcake on this Happy Bastille Day card shows its patriotic spirit with flags and sprinkles - the perfect addition to a special day. 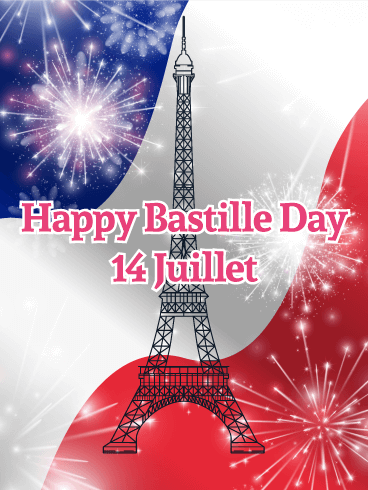 Show your own patriotism and excitement for the holiday by sending this Happy Bastille Day card to everyone you know! All around the world, the Eiffel Tower is easily recognized as a symbol of France. Placed in the same city that survived the siege of the Bastille, this beautiful structure is a proud representation of the strength and resilience of the French people. 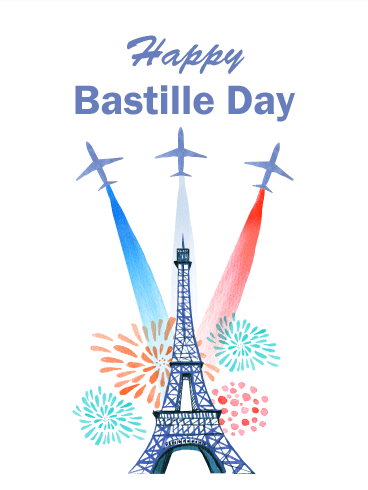 With this artistic Happy Bastille Day card, you can honor and celebrate this important day with Paris' most famous landmark. The heart of a country is always its people. On Bastille Day every year, France's people gather together to celebrate the unity, freedom, and strength they possess. 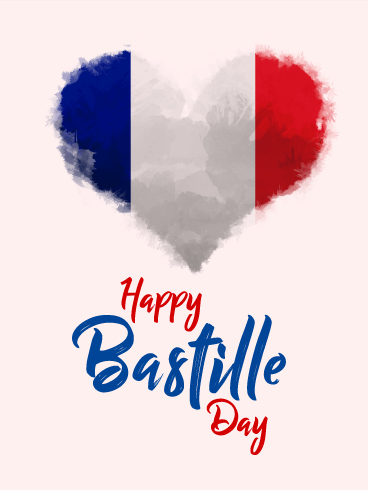 This holiday offers a chance to celebrate the best parts of life with the people you love most, so send them the patriotic heart on this Happy Bastille Day card. Your loved ones will be happy to receive it! Nothing is better or more important than freedom. 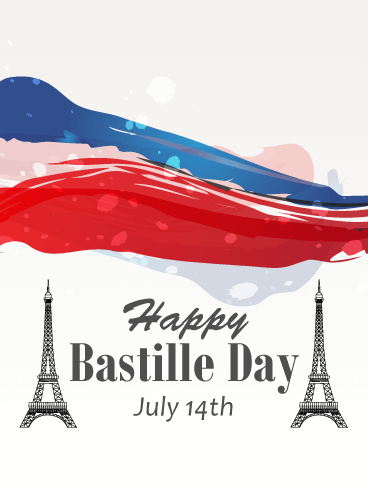 On July 14 every year, France remembers the struggle and sacrifices made to unify their country during the siege of the Bastille built to protect Paris. 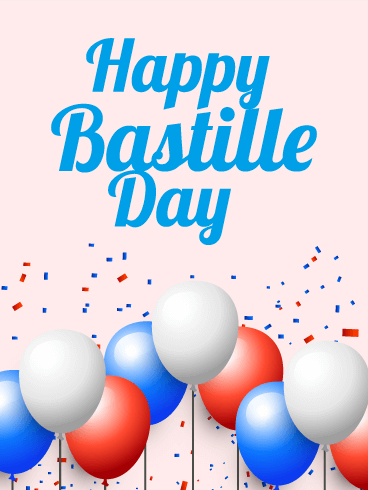 If you have a friend, family member, or coworker who is French, send them this bright and colorful Happy Bastille Day card to celebrate the holiday! No matter what tragedies or struggles affect France, Bastille Day reminds her people that no one and nothing can destroy their unity. In the midst of tragedy, the tenacity and love shown by the French demonstrates the powerful strength they possess. 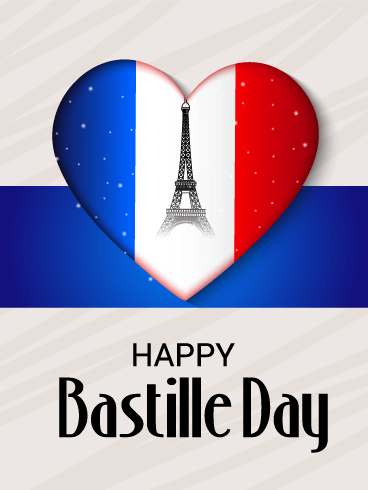 With this Happy Bastille Day card, you can share your love, support, and celebration of France and her people to everyone you know. The shining French Flag will lead anyone to a happy celebration on Bastille Day this year. 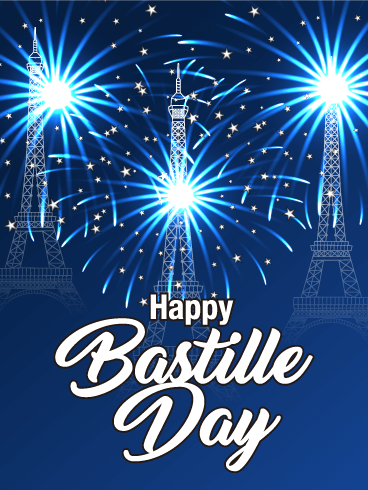 Not only is this Bastille Day Card beaming with the essence of sparking freedom but is also beams with 232 years of hardworking French citizens enjoying life in a free land. 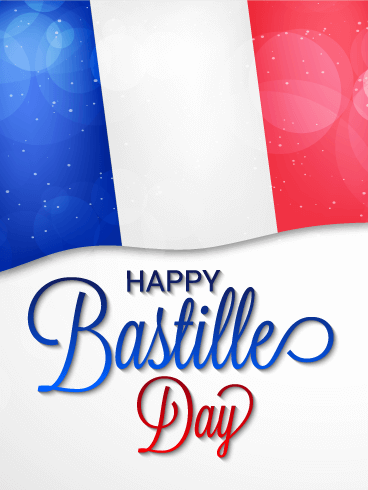 As we celebrate another year of freedom and prosperity in France, send this Bastille Day Card to anyone you care! This watercolor painting of the Eiffel tower can express the genuine pride of all ages on Bastille Day. A happy card such as this will bring joy to anyone. The subtle French Flag background adds a nice touch to truly place a spotlight on the Eiffel Tower in Paris. Send this card to your friends and family to celebrate the special holiday. A banner with the spirited colors of the French Flag atop the outline of the country of France is an excellent view for French National Day. 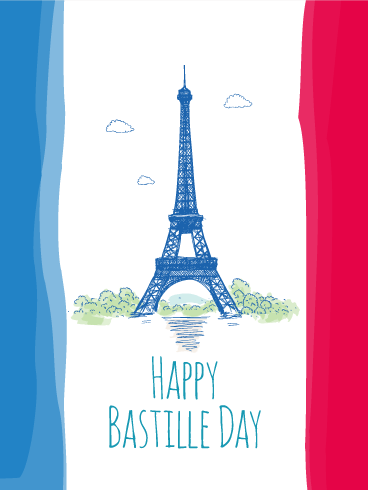 Say, "Happy Bastille Day" to your friends and family with this colorful land of France card today. Bastille Day is typically celebrated with glorious parades and powerful firework shows. 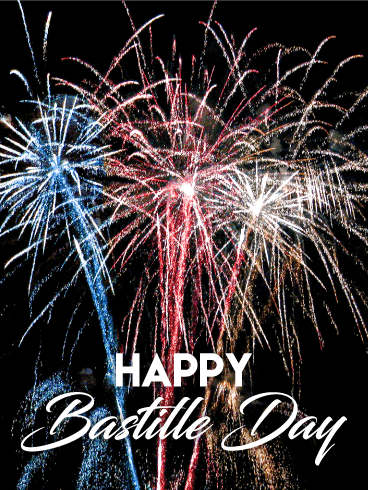 Send a Happy Bastille Day card to your friends and family abroad that shows the great excitement of freedom such as this one with the blue, white, and red French Flag background. The Eiffel tower as the center to represent Paris, France and the booming fireworks throughout. Send one today! Happy Bastille Day! 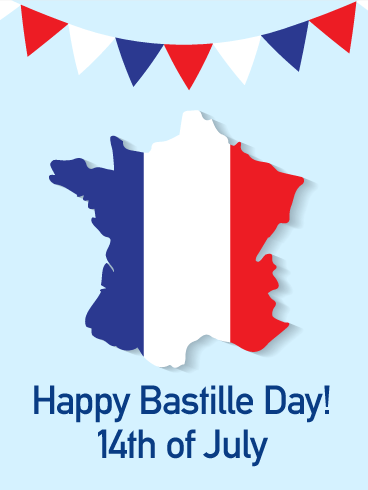 As you get ready to celebrate this special holiday, use this Bastille Day card to show your excitement! The balloons and confetti represent colors of French flag. 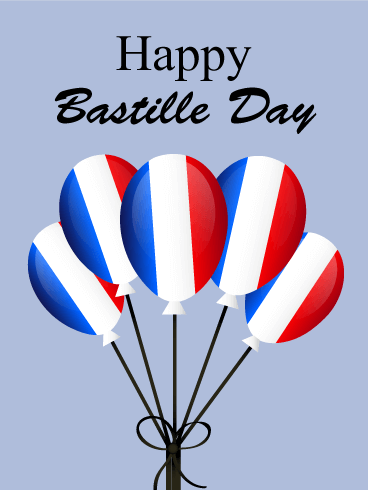 Send this exciting Bastille Day card to your loved ones today.